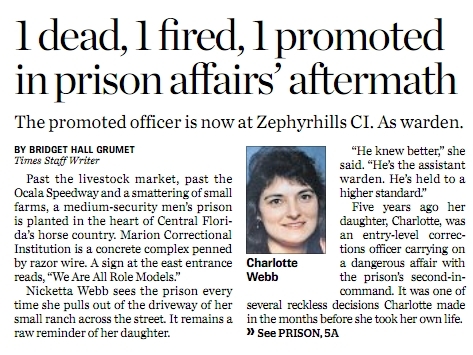 Corrections Officer Charlotte Mae Webb is said to have killed herself on July 29 of 2005. She's gone and can't say a word. What we know comes from 2 different Marion Correctional Institution supervisors who were both supposedly having a relationship with her and who both had much to lose - married Assistant Warden Gustavo Mazorra and married Sgt. George Sherrets. Charlotte's body was found on the floor of her home and she is said to have overdosed on antidepressants but no reference to testing was reported in the news so we don't know if it was assumed because of an open pill bottle or something of that nature. Charlotte is an officer and deserved a full outside investigation.